This volume aims to account for the tremendous changes in the attitudes towards the world and towards themselves that can be seen in the works of Chinese writers in the early centuries of the Christian era. How do the massive conversion of such a large part of the population to Buddhism and the widespread development of the Daoist religion correspond to the conversion of the West to Christianity? Does this conversion to new religions that were replacing the ancient imperial religions represent similar developments on the eastern and western fringes of the Old World? Can we speak with any confidence of the gradual evolution of China from an 'Antiquity' to a 'Middle Ages'? 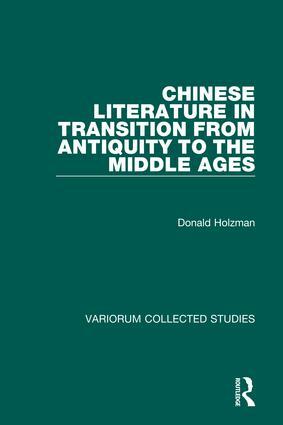 The author attempts to show that, in their attitudes towards literature and their appreciation of landscape, during the Han and the first four centuries of the Christian era, we can see signs of a turning inward and the birth of new forms of spirituality akin to those that arose in the West during the same period. Contents: The conversational tradition in Chinese philosophy; Confucius and ancient Chinese literary criticism; Les premiers vers pentasyllabiques datés dans la poésie chinoise; On the authenticity of the tetrameter poetry attributed to Ruan Ji; Literary criticism in China in the early 3rd century AD; Landscape appreciation in ancient and early medieval China: the birth of landscape poetry; Addenda and corrigenda; Index.